Its so very cold outside, Please Give us a tasty easy to prepare soup recipe! As a Polar Vortex takes the temperatures into the sub zero range that I have no plans to experience first hand I decided today would be a perfect day to stay inside and make a batch of creamy, cheesy comforting cauliflower soup. 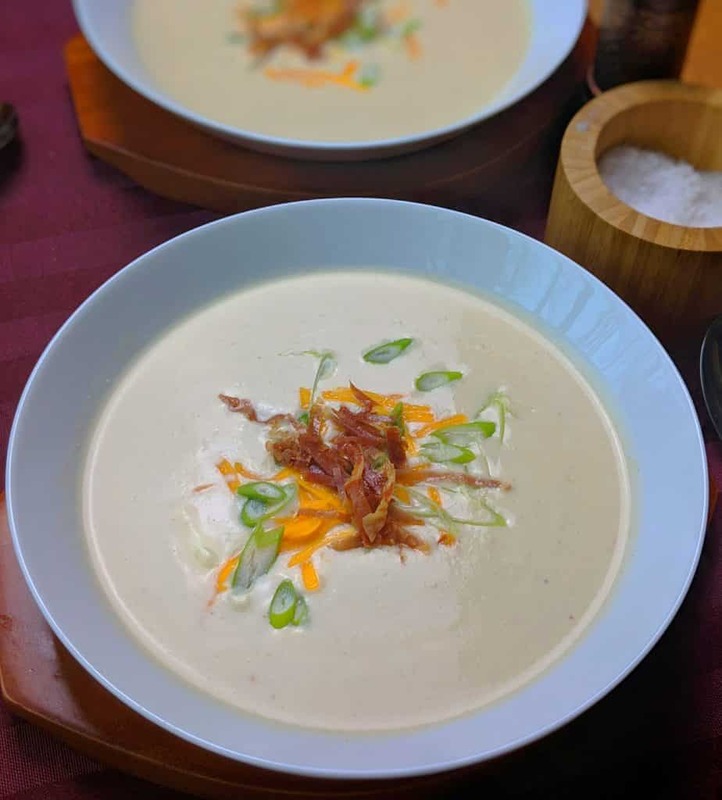 I grew up having loaded baked potato versions of this soup and since I’ve begun my keto lifestyle this cauliflower version exceeds my expectations of how good low carb recipes can be. I know bloggers say all the time that you can’t tell the difference, that’s a lie. Just ask my brother who would rather run naked through the snow then eat even one spoonful of anything cauliflower. That being said I actually prefer the flavor of the cauliflower version of this soup recipe. 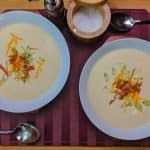 Ways to cook the soup? You can make this soup in a large stock pot or even a slow cooker but I’m going to be using my instant pot for today recipe. 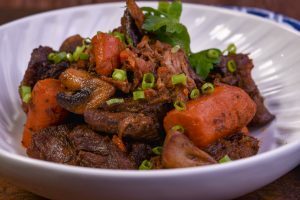 The instant pot gives you the best of both worlds since you can sauté the bacon and onions before putting the lid on and pressure cooking the cauliflower to a perfect tender consistency in only 8 minutes. The crock pot version of this soup would most likely take 2-3 hours and not have near the depth of flavor, not to mention you’d have to sauté the bacon in a separate pan. I’m a big fan of using enameled cast iron pans for soups like this but they do require a little more technique and attention to detail so the instant pot really is a great method to go with in this case. Five Cheeses!! Aren’t you being a bit excessive?? To answer your question with a statement…l love cheese! I love hard cheese, soft cheese, sharp cheese, mild cheese. I’m hard pressed to find a cheese I don’t like. You could easily cut this down to three cheeses if you don’t share my enthusiasm for this funky formage. 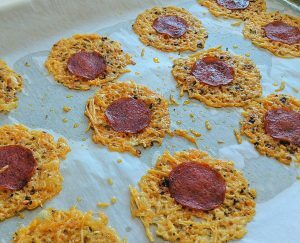 The Parmesan and ricotta have a more functional purpose in the recipe acting as a thickening agent whereas the other cheeses are more for overall texture and flavor. If you don’t have multiple cheeses or just want to keep it simple just pick a cheese that you enjoy and use it. For me I like the combination of different cheeses together to create a unique flavor profile.Gouda has a robust smokiness while Asiago has a sharper nutty flavor and fontina has a rich creamy texture that adds a beautiful velvety sheen to the soup. I don’t Have an Immersion stick blender but I really want to make it…Help!!! I’ve got you covered though i am going to leave a link right here for a very affordable stick blender for next time. Simply ladle out the contents of the pot into your traditional blender and pulse until smooth then transfer to a large container. Once all of the soup is blended smooth pour the mixture back into the instant pot and hand whisk the cheeses until smooth. You’ll have to dirty an extra container and a few utensils but that will motivate you to grab yourself an immersion stick blender from amazon. You deserve it! 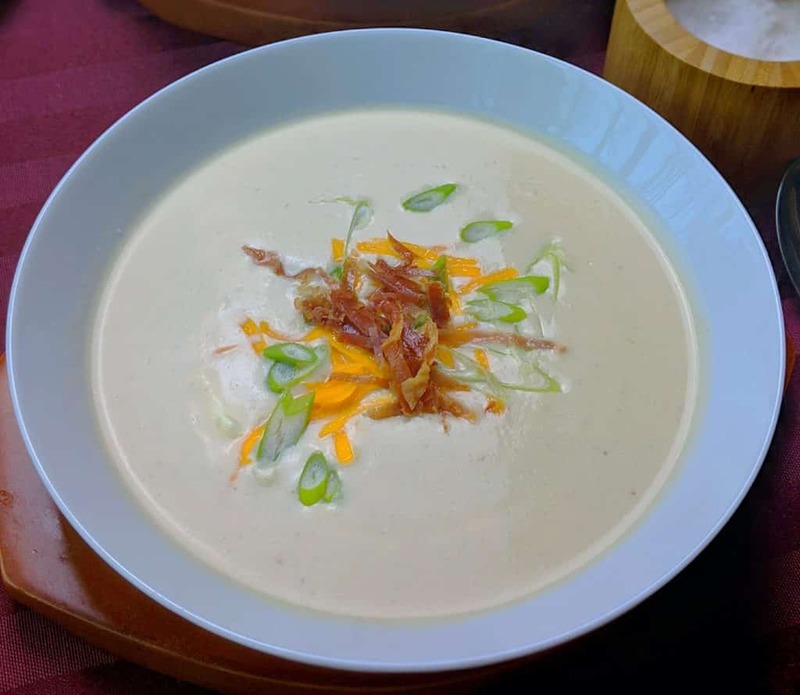 I hope that you give this five cheese creamy cauliflower soup a try not only because it’s absolutely delicious and filling and warm and cheesy but it’s relatively easy to make and perfect part of a low carb lifestyle. Well that’s it, if you’ve read this far into my blog and you’re still not convinced to try my recipes then I have failed you as a person and more importantly as a food blogger. 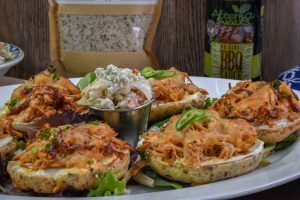 Leave a comment and let me know what you think either way so I can keep creating delicious keto and low carb recipe that anyone can prepare with ease. Chop bacon into ½ inch pieces and add to the instant pot set on sauté. Stir occasionally until crispy then set aside on paper towels to cool. Add in diced onion and chopped cauliflower. Cook for about 10 minutes browning the cauliflower and onion. Add in chicken broth and heavy cream and scrape any brown bits off the bottom of the pan. Stir in your seasoning, place the lid on making sure the vent is closed then set the instant pot for 8 minutes on high pressure. Once the instant pot has finished its cycle slow release for 15 minutes before removing the lid. Using an Immersion stick blender add in your cheeses one at a time starting with the ricotta, then Parmesan then the remaining cheeses.